Tennessee came to play on Wednesday night, defeating Bruce Pearl’s Auburn Tigers by a final score of 97-59 in Bridgestone Arena in Nashville. Coach Rick Barnes said this game “came down to attitude.” Tennessee prolonged its season by at least one more game, winning its first ever contest on a Wednesday night in the SEC Tournament. The rout was never really in doubt. UT jumped out to a 12-2 advantage at the first media break and never looked back, taking a 44-25 lead to the locker room at halftime. Here are five observations from Tennessee’s big win on Wednesday night. Armani Moore Dominated: Armani Moore was electric, scoring 22 points on an astounding 10-of-13 shooting performance. 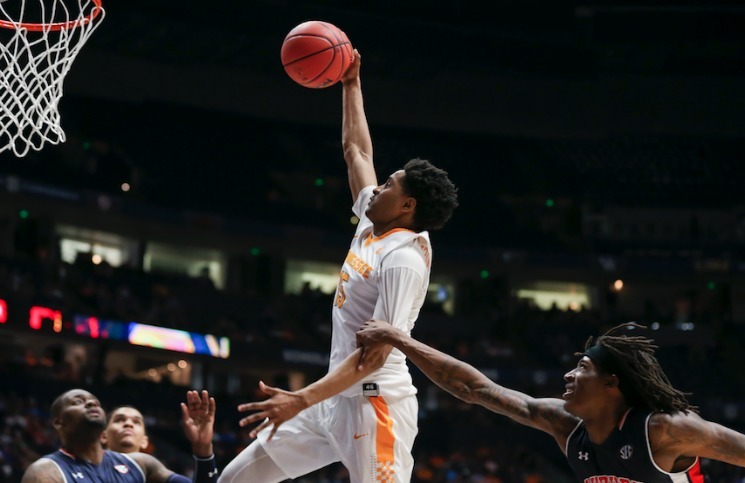 The Tennessee senior fought hard in what could have been his final game as a Vol, dictating the tempo of the contest as a guard and as a forward. Moore’s effort was a product of his ability to get into the lane with ease. With his athleticism on the drive, Moore drew two or three defenders and was able to find open shooters for five assists. You got the sense that Moore was not going to be stopped on Wednesday, and with his contribution Tennessee lives to fight another day in Nashville. Reese hit two 3-pointers and grabbed 11 rebounds in his second consecutive start. In a season that has seen lots of change around the program, Baulkman and Reese came up big in their final SEC Tournament. Defensively, Baulkman was superb against 3-point specialist Bryce Brown, helping the Tennessee defense hold brown to 1-of-8 shooting from downtown. His confidence showed, as Moore pushed the tempo of the game from the outset. Barnes said, “Armani was wanting to run more than we were running.” Following a rough performance against Ole Miss, Phillips had just five points on 1-of-5 shooting. It appears Barnes is valuing the experience of his veterans to carry Tennessee the rest of the way out. Another Poor Shooting Performance: Back in February, Tennessee dominated Auburn 71-45 at Thompson- Boling Arena. The Tigers shot 24% that night, and on Wednesday, they only hit 30% of their shots. Auburn missed plenty of open looks from behind the arc, shooting an abysmal 4-of-24 from long distance. Much of Auburn’s offense hinged on their post play. Bruce Pearl relies on Tyler Harris and Cinmeon Bowers to control the game from the forward position like former Vols Tyler Smith and Tobias Harris. Tyler Harris had 14 points, but Bowers was nowhere to be found, tallying just five points on seven field goal attempts. Auburn’s bigs were silenced for the most part, due to interior defense from Armani Moore and Derek Reese. Pearl’s team finished the game with only 15 points. Thompson-Boling West: Bridgestone Arena was painted orange. Tennessee fans showed up in a big way, staying until the very end. Ten different players scored for Tennessee, including walk-on guards Brad Woodson and Lucas Campbell. The Nashville crowd featured plently of orange, and the arena was perhaps at its loudest after a Campbell 3-pointer in the final minute of the game. Thursday afternoon Tennessee takes on Vanderbilt at 3:30 p.m. ET. Given the amount of Tennessee fans at Wednesday night’s game, Tennessee may have another home-floor advantage, which has proven to be vital to its success this season. In order for Tennessee to continue to play as well as they did on Wednesday night, Barnes will hope his team continues to feel right at home in Music City. Will is in his third year covering the Vols with Rocky Top Insider. He is a former UT athlete, running Cross Country and Track & Field for the Vols before becoming the public address announcer for the UT track program last spring.